Through intimate interviews and live performances, They Played For Their Lives artfully portrays how music saved the lives of young musicians. 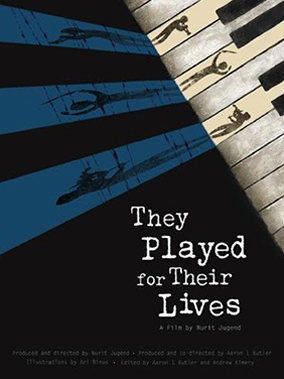 Playing music in the ghettos and concentration camps fostered spiritual strength within themselves and others, and often proved a bargaining tool that spared their lives. Chaim recounts saving his father from beatings by teaching an SS officer to play the harmonica. Anita, who played cello in the Women's Orchestra in Auschwitz, was spared inhumane forced labor. Little Hellmuth whistled with the band in exchange for extra food and clothing. Each of these unique stories illustrate the power of music to sustain the human soul. At the end of the war their lives unfold in surprising ways, yet music remains at the core of their memory and legacy. Charcoal illustrations, live piano performance by 106-year old Alice, and a moving reunion of two boys after 66-years of search, make this compelling viewing. Dr. Nurit Jugend is a composer whose works have been published, performed and broadcast worldwide. She works internationally with leading orchestras and ensembles, such as the Israel Philharmonic under Zubin Mehta. Jugend lectures at Stanford University, national conferences across the US and international events.